William Penn established the town of Dover in 1683. As surveyed in 1717, the town featured three public squares including The Green. 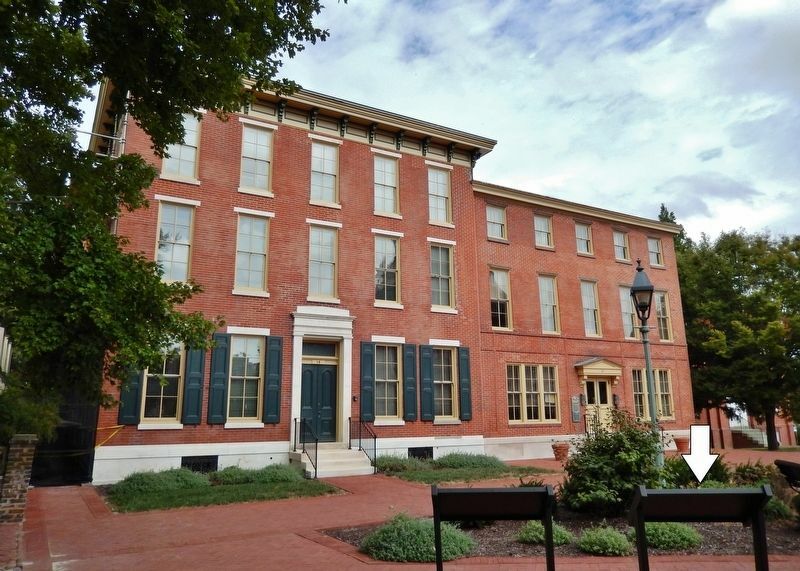 Surrounded by government buildings, shops, homes, and taverns, The Green became the heart of Dover. During the American Revolution, it was the setting for troop reviews, markets, and public gatherings. On December 7, 1787 thirty delegates, ten from each county, met at the Golden Fleece Tavern facing The Green and ratified the United States Constitution, giving Delaware a place of honor as "The First State." The usual quiet dignity of The Green belies its role as a hub of community activity. As in the past, annual festivals bring color, music, dancing, and historical demonstrations. Dover Days in the spring is a blend of traditions and modern attractions. The Market Fair each autumn faithfully recreates various aspects of 18th century life including crafts, games, and a militia muster. 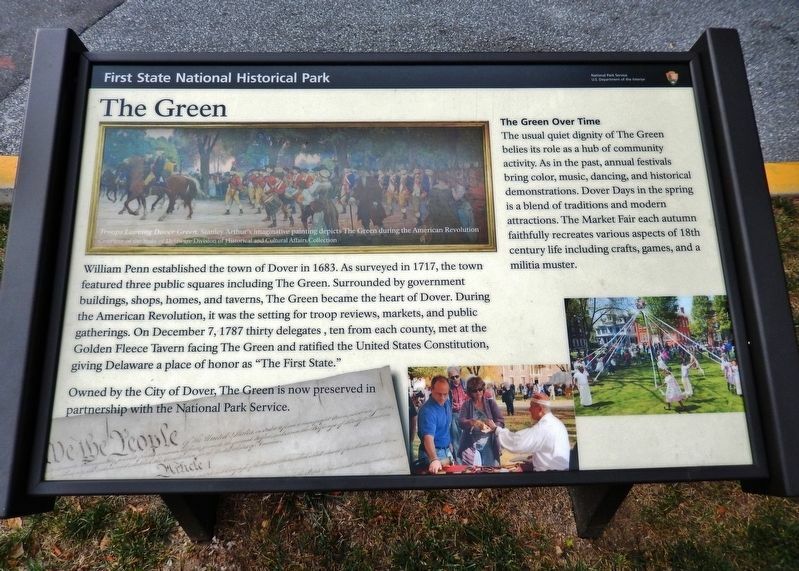 Owned by the City of Dover, The Green is now preserved in partnership with the National Park Service. Location. 39° 9.398′ N, 75° 31.394′ W. Marker is in Dover, Delaware, in Kent County. Marker is on The Green east of South State Street, on the right when traveling west. Touch for map. Marker is located beside the sidewalk at the northeast corner of The Green. Marker is at or near this postal address: 15 The Green, Dover DE 19901, United States of America. Touch for directions. Other nearby markers. At least 8 other markers are within walking distance of this marker. Delaware Decides (here, next to this marker); Ridgely House (a few steps from this marker); State House (within shouting distance of this marker); The Delaware Line (within shouting distance of this marker); In the Council Chamber of Elizabeth Battell's Golden Fleece Tavern (within shouting distance of this marker); The Golden Fleece Tavern (within shouting distance of this marker); An Army of Restoration (CCC) (within shouting distance of this marker); Kent County Courthouses (1680-1983) (within shouting distance of this marker). Touch for a list and map of all markers in Dover. Stanley Arthur's imaginative painting depicts The Green during the American. More. Search the internet for The Green. Credits. This page was last revised on April 13, 2019. This page originally submitted on April 10, 2019, by Cosmos Mariner of Cape Canaveral, Florida. This page has been viewed 110 times since then. Photos: 1. submitted on April 12, 2019, by Cosmos Mariner of Cape Canaveral, Florida. 2, 3. submitted on April 13, 2019, by Cosmos Mariner of Cape Canaveral, Florida.